Imagine a world where cheese isn’t part of your diet, and it’s totally absent from your favorite restaurant dishes. Before 1958, that was the reality of the people of Korea. Koreans had never even tasted cheese until Didier t`Serstevens, a Belgian priest, arrived in Imsil County, and started raising goats and making his own cheese. Imsil’s governor wisely asked him to teach his cheese-making skill to the rest of the community, and so Imsil became the cheese capital of Korea. 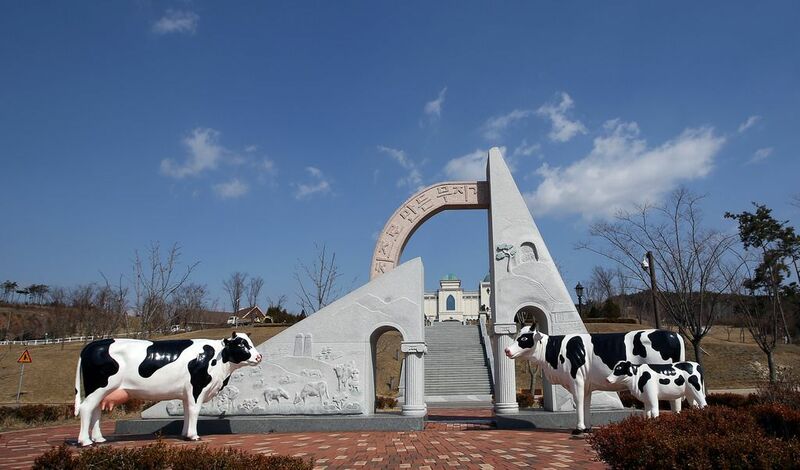 To celebrate how cheese revolutionized Korea’s gastronomy, the 32-acre Imsil Cheese Theme Park opened in 2004. Visitors to the park can learn about, make, and eat cheese in its various forms, and partake in a number of cheese-themed rides. Take a slide past grazing goats to the Cheese Playland, or wander the walkways that take you by cheese-wheel buildings and various cartoon statues. There are even a few “cheese experience” centers, where you can take a more hands-on approach and make cheese for yourself. Add to this a milk processing factory, local specialty shop, two restaurants, and a science lab for researching different methods of cheese creation, and you’ve got a pretty exciting, dairy-filled day trip. So, if you’re planning on traveling to South Korea, why not take advantage of this cultural and culinary experience rolled into one? To pay homage to Didier t`Serstevens, and eat your fill of delicious cheese, visit the park any time between 10 AM and 8 PM, Tuesday to Sunday.